With only days to go until New Zealand Fashion Week, we stopped by some of the Bridal Industry's elite to get word on what we'll see next. 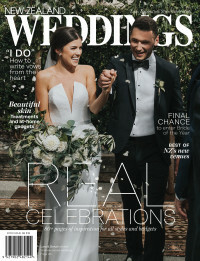 Working Style are wedding suit specialists who we have the know-how and the expertise to take the stress away entirely. New Zealand Weddings: Can you give is a sentence about what we’ll see on the runway this year from Working Style? Chris: Softly tailored pieces used in unexpectedly ideal ways for the modern antipodean wedding, including unique combinations of black tie day wear, formal cottons or linens and casual woolen suits. What details do you think will be big in grooms' attire in 2018, and beyond? Personalisation continues to be a key area for men wanting to look their best on their wedding day. Tailor-made garments with unique cloths chosen by you complete with details such as personal embroidery will continue to set the benchmark for men’s wedding attire. What detail would you love to see make a comeback? What kind of feeling do you want to evoke on the runway this year? What is one tip you can share about making decisions on suiting? Select your outfit based off what looks right for the venue (or vice versa). An evening ceremony carries a different level of formality to a day wedding at the beach. Everything will appear more appropriately styled and make sense. Working Style will show their latest collection at the 2017 New Zealand Weddings Magazine Collection Show at New Zealand Fashion Week. Click here for all the details.